In March 2002, Moscow-based GKNPTs Khrunichev started negotiations with South-Korean representatives on the possible joint development of the first launch vehicle for Korean Aerospace Research Institute, KARI. According to Khrunichev, it won the South-Korean contract in a fierce competition with a number of other contenders in various countries. However, according to American sources, they "rejected" South-Korean overtures over the concerns for the proliferation of rocket technology. KSLV-1 rocket and its flight profile. The Russian side would also supply documentation for the servicing of the system and conduct technical supervision of the launch complex construction in South Korea. 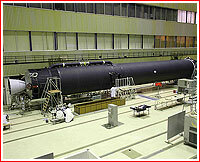 Russian KBTM design bureau took responsibility for the development of the launch facility. However ground support hardware for both the processing and launch complex would be manufactured at South Korea based on Russian blueprints. The work would reportedly involve automotive and aviation and ship-building industry in South Korea. All launches of the vehicle would be conducted by joint Russian-Korean teams. At GKNPTs Khrunichev, the company's veteran Sergei Shaevich served as the director of the KSLV project, with V. V. Sinitsin working as the chief designer. The condition for the agreement was Korea's compliance with international legislation on non-proliferation of rocket technology. Using Russian documentation, South Korea would build hardware for the launch facility, while a joined Russian-Korean team would conduct a flight test program. Like the URM booster on the Angara rocket, KSLV's first stage would feature a version of a single RD-191 engine, known as RD-151. The second stage of the KSLV-1 rocket burning solid propellant would be developed in South Korea based on the experience with KSR-1, KSR-2 and KSR-3 rockets, which flew a total of four successful suborbital missions. The first two vehicles had solid-propellant motors, however the third was equipped with a liquid-propellant engine. Launches of KSLV rockets were to take place from the Naro Space Center in Goheung, on an island off the country's southern coast and around 480 kilometers south of the nation's capital, Seoul. The launch center occupied an area of around six square kilometers. 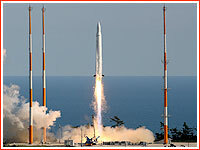 However following two botched launches in 2009 and 2010, blamed by the Russian side on the Korean-built upper stage, the third rocket would not reach the launch pad until the fall of 2012. During a visit to GKNPTs Khrunichev by the Deputy Chairman of the Russian Government Dmitry Rogozin on May 5, 2012, the company issued a press-release promising the third launch of the KSLV rocket at the end of the year. During the night from August 22 to August 23, the third KSLV rocket was shipped by rail to Ulyanovsk, Russia, from where the Polyot company was to carry the vehicle onboard a transport aircraft to Pusan, South Korea, before another trip by rail to the Naro space center. Khrunichev would not publicly disclose the fact of shipment until four days later. On October 24, 2012, the third KSLV-1 rocket was rolled out from its processing building to the launch pad and erected into vertical position. Its launch was scheduled for October 26 between 3:30 p.m. and 7 p.m. local time, however a helium leak in the interface between the rocket's first stage and the launch pad discovered few hours before a scheduled liftoff required to postpone the mission for at least three days. The rocket had to be removed from the launch pad and returned to the processing building. On October 28, the Interfax news agency quoted Russian industry sources as saying that required seal replacements and a three-day countdown operations would not be completed by the end of the launch window on October 31, thus pushing any next launch attempt to the middle of November as the earliest. On October 29, Korean Aerospace Research Institute, KARI, announced that the next launch attempt would take place on November 9, with the launch window extending until November 24. By the end of November, the mission was postponed to 2013. 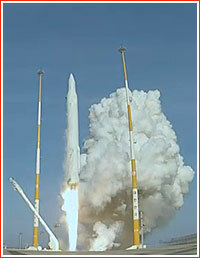 Before the end of 2012, the launch was expected as early as Jan. 25-26, but the attempt was actually set for January 30. This time, the launch window extended until February 8, 2013. 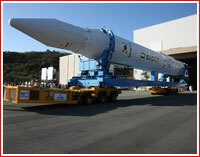 The vehicle was rolled out to the launch pad on January 28. The South Korean launch vehicle built with Russian help finally succeded in delivering a satellite into orbit on its third attempt. The KSLV-1 rocket carrying the STSAT-2C spacecraft lifted off from the Naro space center on Jan. 30, 2013, at 4 p.m. Korean time (2 a.m. EST, 11:00 Moscow Time). The exact liftoff time was publicly announced around two hours before the actual launch attempt. Both previous launches of the KSLV-1 rocket failed to reach orbit. The first stage of the KSLV rocket burning liquid oxygen and kerosene was developed at GKNPTs Khrunichev in Moscow. It closely resembled a standard booster of the yet-to-be-introduced Angara family of launch vehicles. KSLV's second stage was powered by a solid-propellant engine developed in South Korea. 2002 March: GKNPTs Khrunichev started negotiations with South-Korean representatives on the possible joint development of the first launch vehicle for Korean Aerospace Research Institute, KARI. 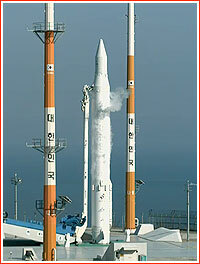 2005: GKNPTs Khrunichev started the development of the South Korean launch vehicle, KSLV. 2009 Aug. 25: A South-Korean Naro-1 (KSLV-1) launch vehicle, fails to deliver the STSAT-2 satellite from the Naro space center, South Korea, due to an upper stage failure, despite initial reports about a successful launch. 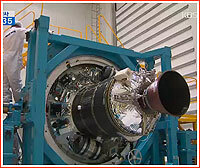 However Russian-built first stage, which was identical to the Angara's URM-1 booster, reportedly performs well. The mission was delayed from mid-August 2009. 2010 June 10: A South-Korean KSLV-1 launch vehicle fails some 136-137 seconds after the launch during the powered flight of the Khrunichev-built first stage. A simultaneous loss of telemetry and a bright flash of light are recorded at the time of a mishap. The failure could have major implications for a long-delayed maiden mission of the Angara rocket. 2012 Aug. 22-23: GKNPTs Khrunichev ships the third KSLV-1 vehicle to South Korea. 2012 Oct. 26: A technical problem with the first stage requires to return the third KSLV-1 rocket to the processing building. 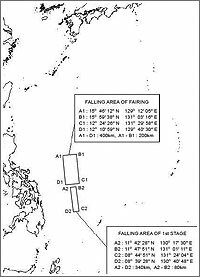 Impact zones for a payload fairing and the first stage during launches of the KSLV-1 rocket. On August 25, 2009, a Russian-built booster powered by RD-191 engine lifted the first South-Korean space vehicle (top), paving the way to the Angara family of rockets. 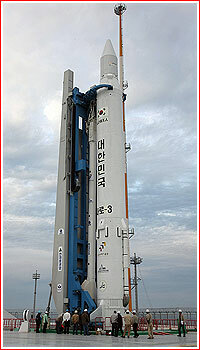 However, the mission itself failed due to the failure of the Korean-built upper stage.